Geoff’s book, ‘The Blackburn Beverley’ is nearing publication. Latest information is that publication will be in April 2011. The book contains a large number of stories and anecdotes by people who worked with the Beverley, also illustrations of paintings of the Beverley. Download a PDF flyer about the book. There is a discount on the published price for Association members. E-mail ch-scoval@blueyonder.co.uk to pre-order. Mention that you are an Association member, giving your membership number. 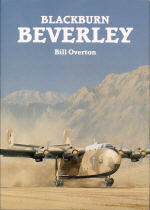 The late Bill Overton wrote books about the Beverley and the Vickers Valetta. The Beverley book tells the story of the Beverley from its inception as the GAL60 Universal Freighter to its scrapping. The work of the Beverley around the world is well written about, and the many pictures illustrate the type of work it did. Each Beverley Squadron and OCU has its own chapter, and other chapters look at the Beverley and the Army, and the makers of the aircraft. The book is still available from some Internet dealers. A short booklet by the makers of the Beverley. The words "No other aircraft" grace the cover of the booklet, words that were often said about the Beverley. The content is a brief description about what the Beverley had being doing since its introduction into the RAF. Illustrations show the Beverley around the world, and with cargoes such as three City of London State Coaches which were taken to a trade fair in Helsinki in 1957. I do not know where this booklet may be available. I found my copy in the on-line catalogue of a bookseller in Australia.